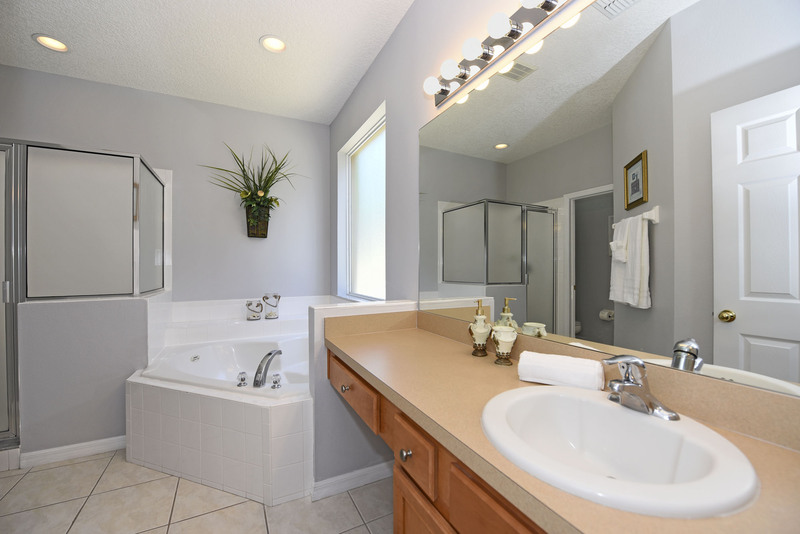 2018 Renovated home w/ outdoor TV & south facing jumbo pool and spa! 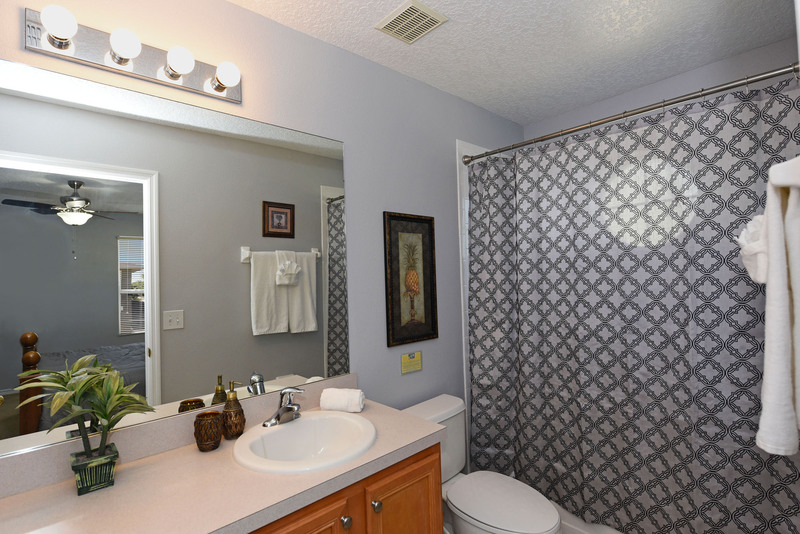 PLEASE SEE THE VIRTUAL TOUR LINK TO ACCESS THE ENTIRE HOUSE!! 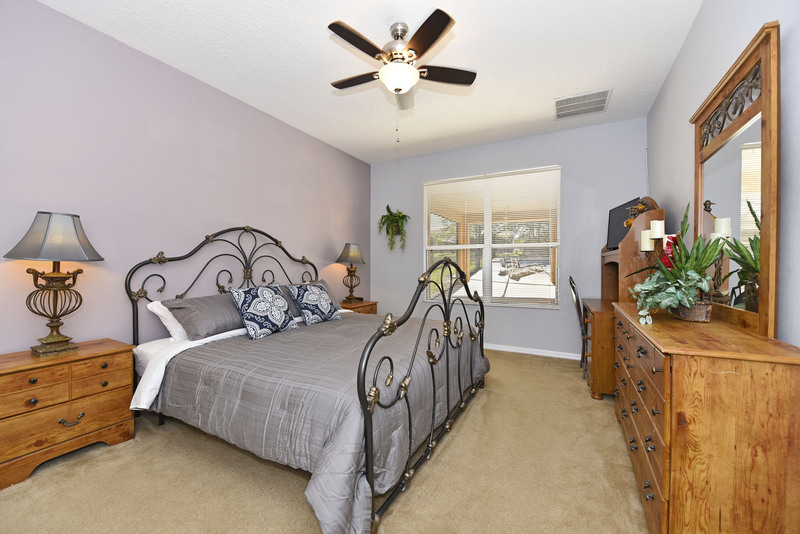 Welcome to our luxurious private oasis in the beautiful Emerald Island Resort, just around the corner from Disney and other main attractions. Located off the famous US 192 tourist corridor, the visitors find themselves surrounded by every amenity imaginable. 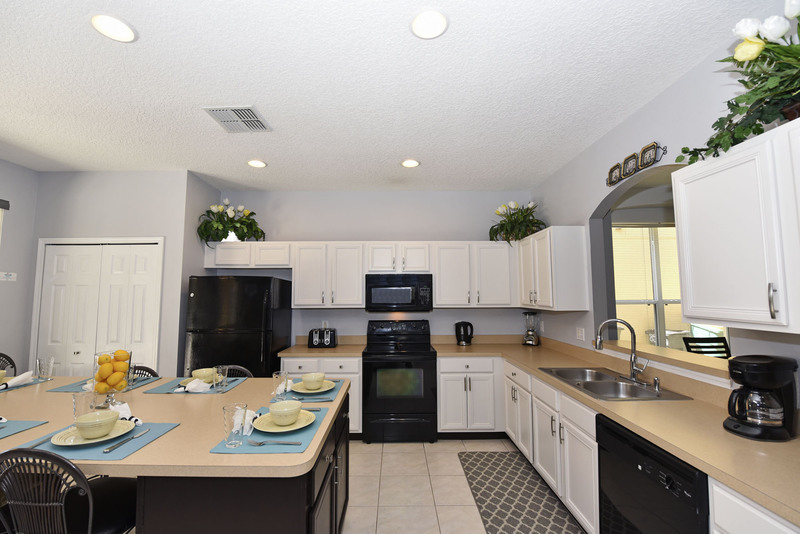 Restaurants, groceries, big box stores, souvenir shops and a host of other businesses and activities are within a mile or two of our vacation home. Not to mention that you’re on the door steps to the Disney theme parks. As you drive up through the winding, palm lined road with the colonnaded entry, you will be amazed at the dramatic entrance to this gated enclave. Once through the front gates, you will feel as if you have entered a special preserve...Emerald Island is surrounded by a Conservation Area and encompasses over 300 acres with 11 heavily wooded acres right in the middle of the community. It is just the beginning of the grandeur that awaits you at our home! 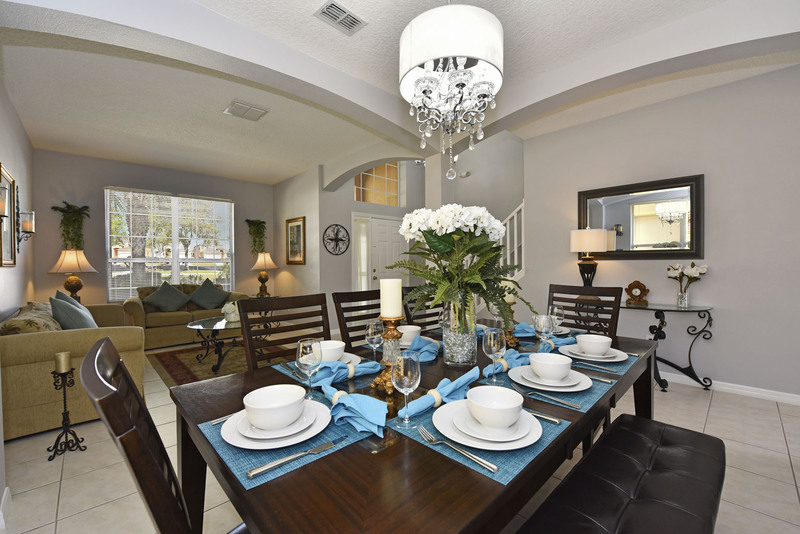 Our luxury home consists of 6 bedrooms and 6 bathrooms. 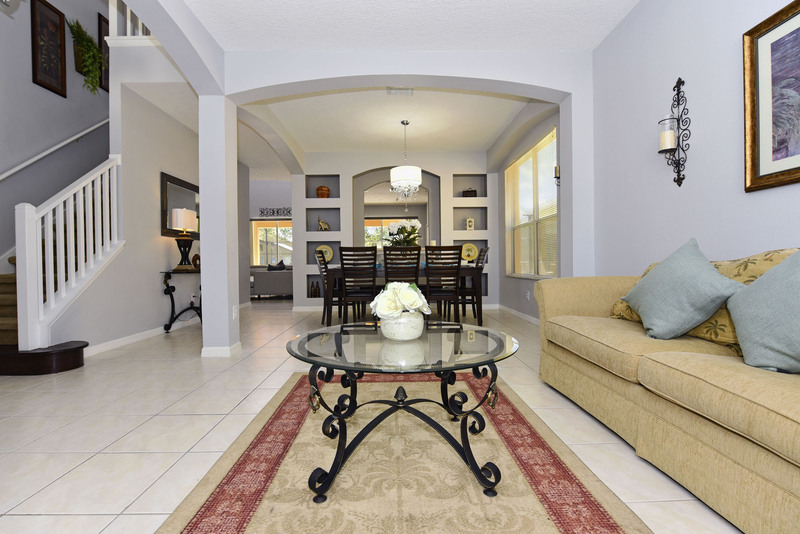 The huge covered lanai has been furnished to pamper your family and friends under the warm Florida sun. This home has been updated in 2018 from every angle, including; brand new carpets, interior & exterior paint, smart TVs in every bedroom, 55" Smart 4K TV in the family room with a luxurious leather sectional sofa, Outdoor 42" TV, modern furniture throughout, Games room with pool table and much more! We carefully chose every item for this house in order to make it our dream vacation home. 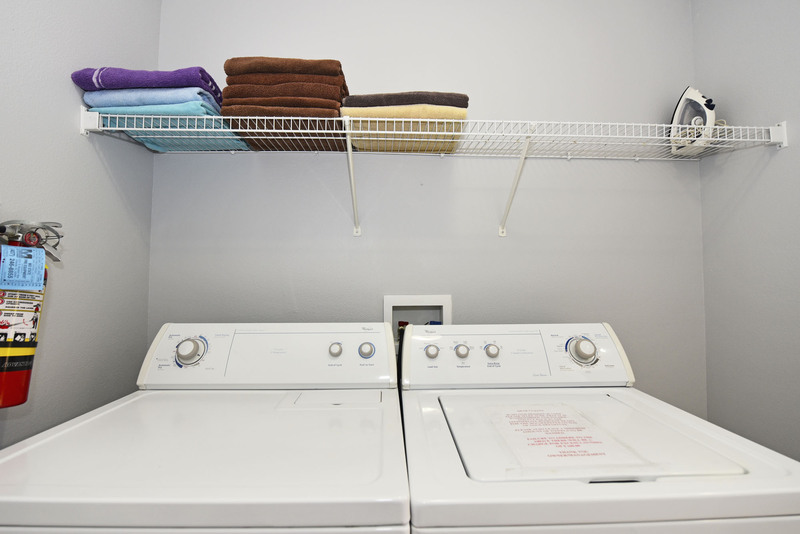 The bedrooms consist of 4 king suites with their own full baths and 32" Smart Tv. 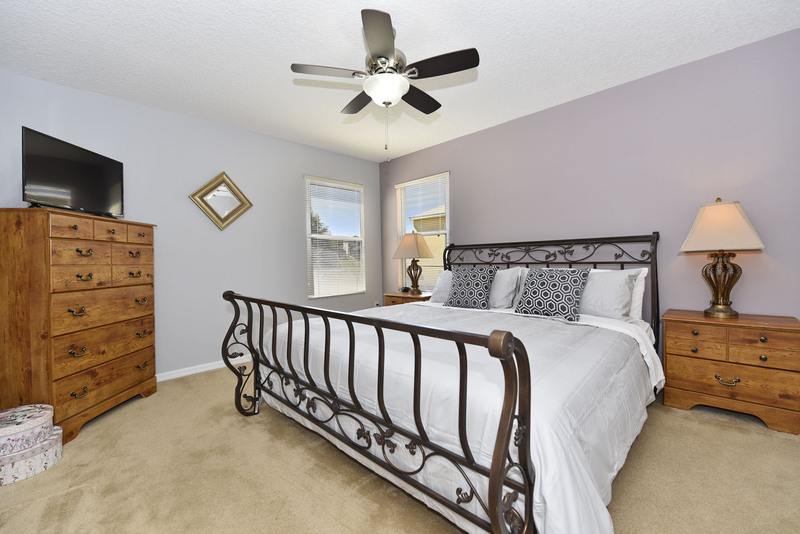 One master bedroom is located on the first floor offering a large full bathroom with a separate shower, double vanity, large Jacuzzi tub & a large walk in closet. We haven’t forgotten about the most important members of the family. 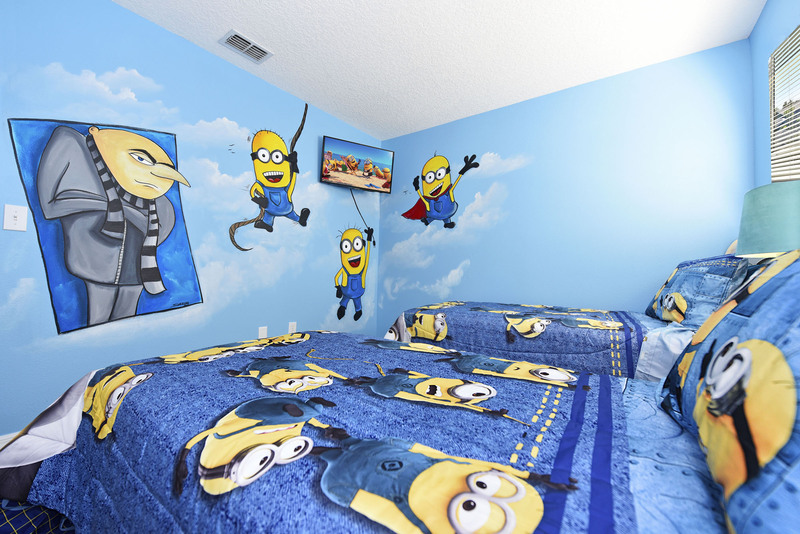 Specially designed Minions and Toy Story theme rooms await the kids. The Minions room includes 2 single beds. A custom painted room and decorations will really get the kids excited for this vacation experience. The Toy Story room also has 2 single beds. 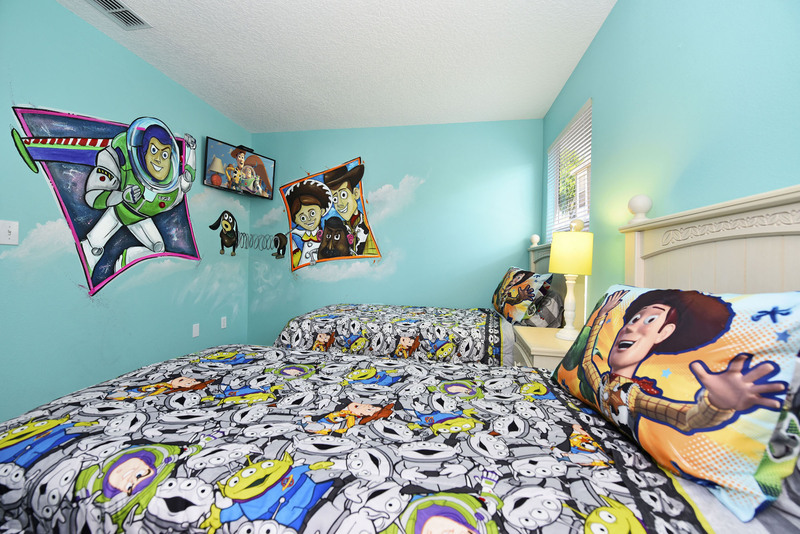 This room is also custom painted with Toy Story theme in mind. Both themed rooms include a swivel mounted 32" Smart Tv so you can enjoy your Netflix account and many other "AT HOME FAVOURITES." 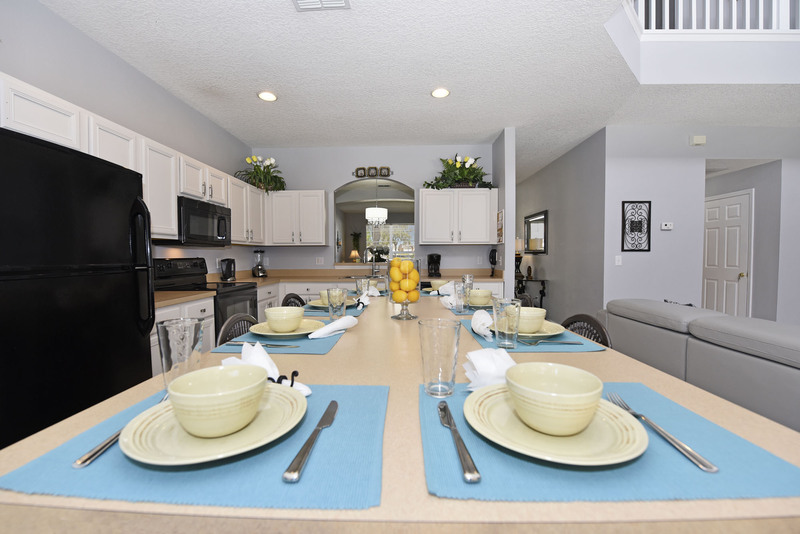 The kitchen is fully equipped with the vacationer in mind, ensuring that it feels like a true get away. We know how important a good cup of coffee is to start your day. With that in mind, the large Keurig is available for the coffee pod users. All appliances from the toaster, to the crock pot, you will find everything that you will need to prepare delicious meals. The lanai leads out to the south facing luxury pool, which is one of the largest swimming pools in the entire area. At night the pool and spa can be lit up for ultimate relaxation. 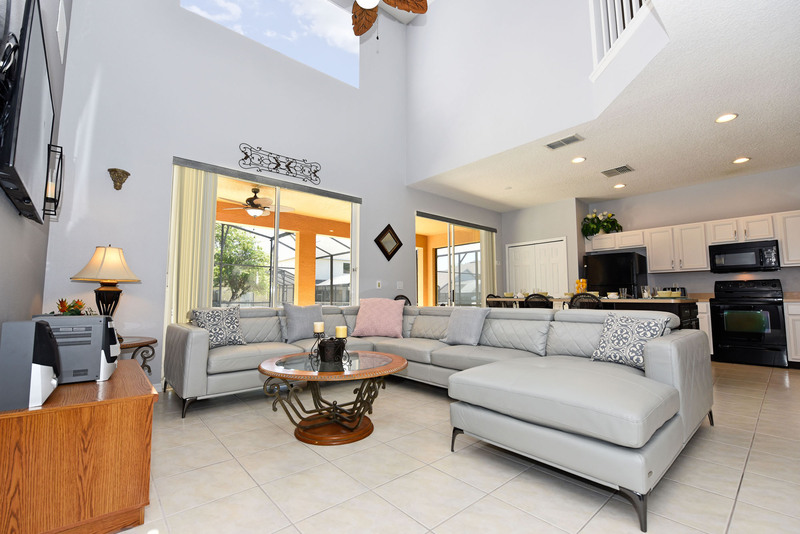 There is abundant seating under the lanai for a large group of people. This includes 2 tables and a BBQ to enjoy your outdoor meals with plenty of seating. There is also plenty of lounge chairs for the sun worshippers as the pool area is directly South facing and never void of the Florida sun. 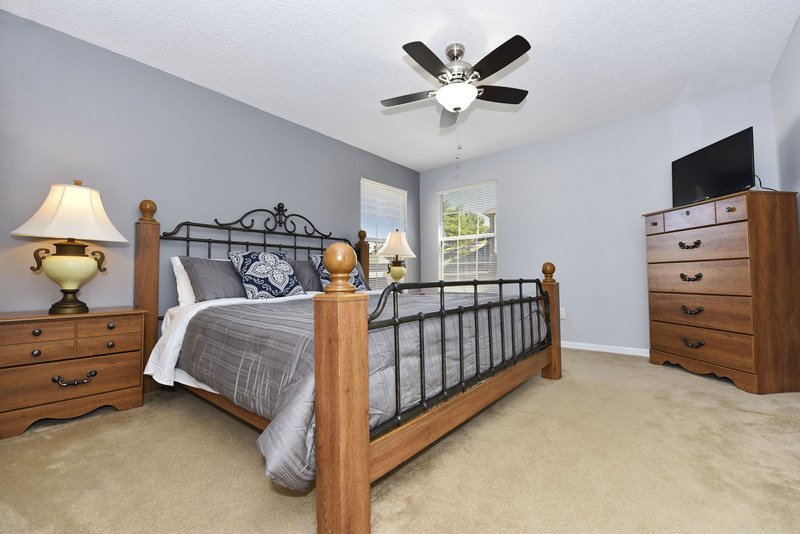 After a long day of enjoying the neighboring Disney theme parks or any of the numerous other activities that Central Florida has to offer, it’s time for quality family time. 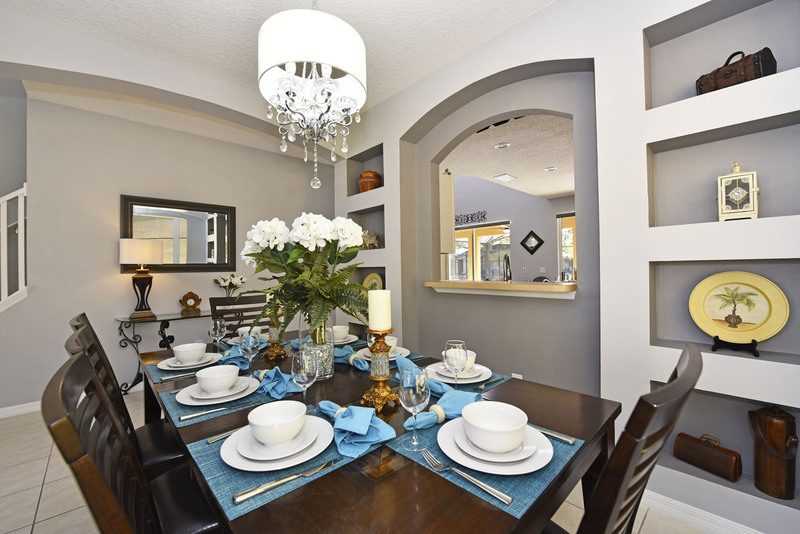 Discuss the adventures of the day during dinner on the expansive dining table. Enjoy a night time dip or swim laps in the massive heated pool. 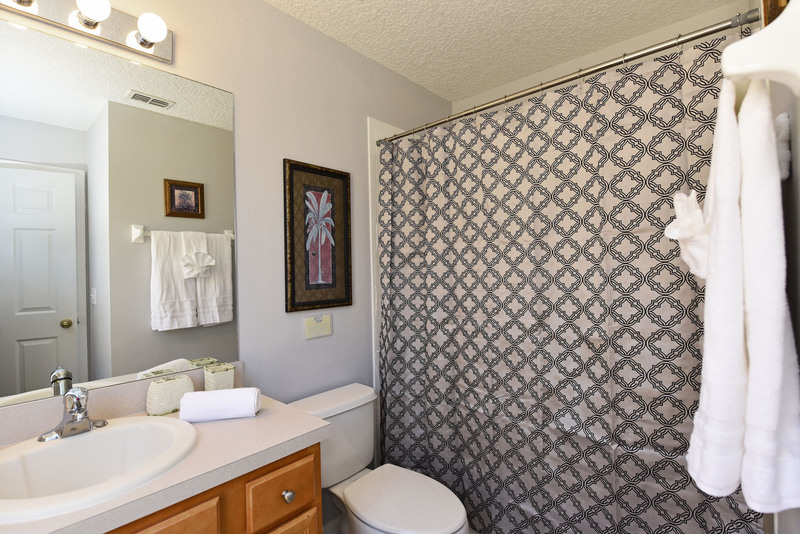 Perhaps, just close your eyes in the spa and let the hot water jets relax your muscles in the privacy of your oasis. The soothing acoustics of the surrounding nature adds another element to your relaxation. 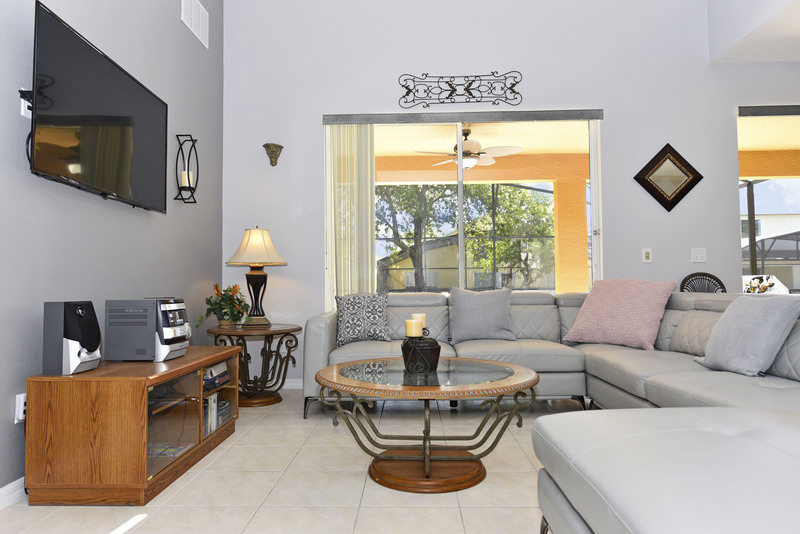 Take a siesta under your large covered lanai or watch a movie under the stars on the outdoor cable ready TV. Perhaps the highlight to your day will be to wind down with the family in our newly designed games room. 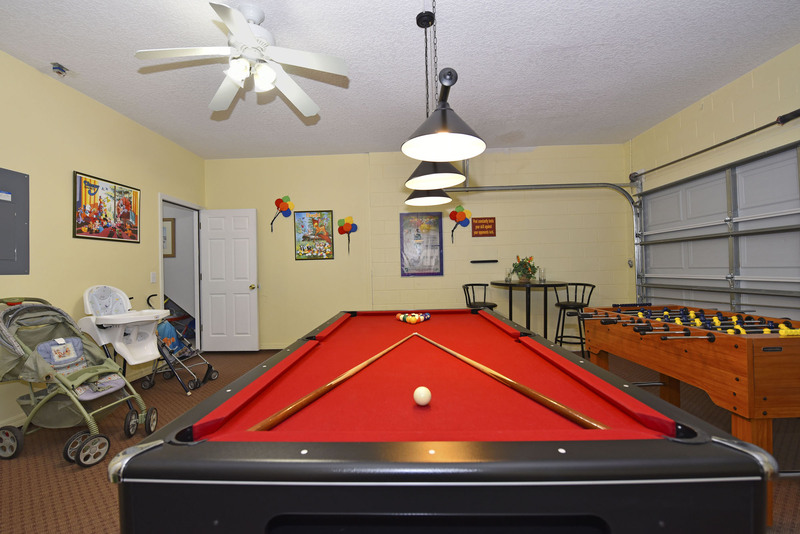 Challenge yourself to a game of billiards or play a fun game of foosball. Emerald Island Resort is a 24 hour Security gated community offering many amenities to its guests including; Tennis \ Basketball \ Volleyball courts, fitness center, Tiki Bar, Business center, outdoor pools, kiddie parks and walking trails. We truly hope that you enjoy our home as much as we do and really make this a vacation in which you build everlasting memories. Hi Carmine, Thank you for your kind review, we are delighted you had a great time and look forward to welcoming you back very soon. Regards John. 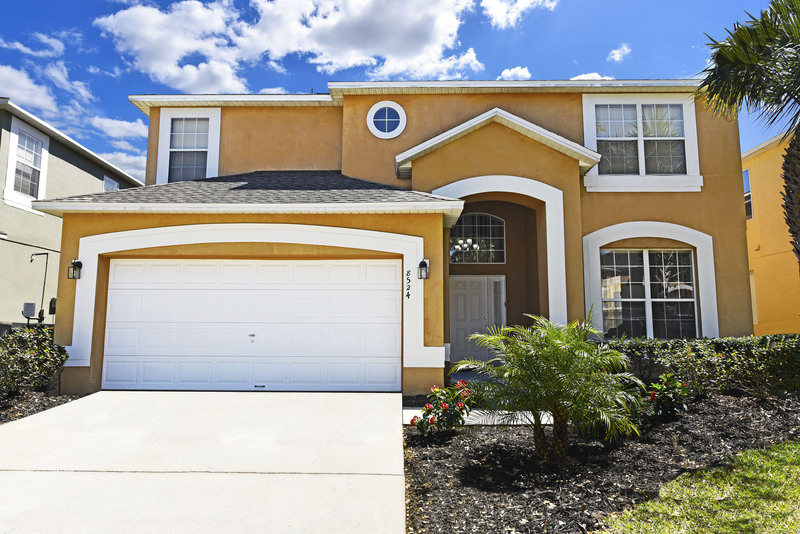 The Arfmann family just returned from our trip to Orlando, and we used your website to rent a house. 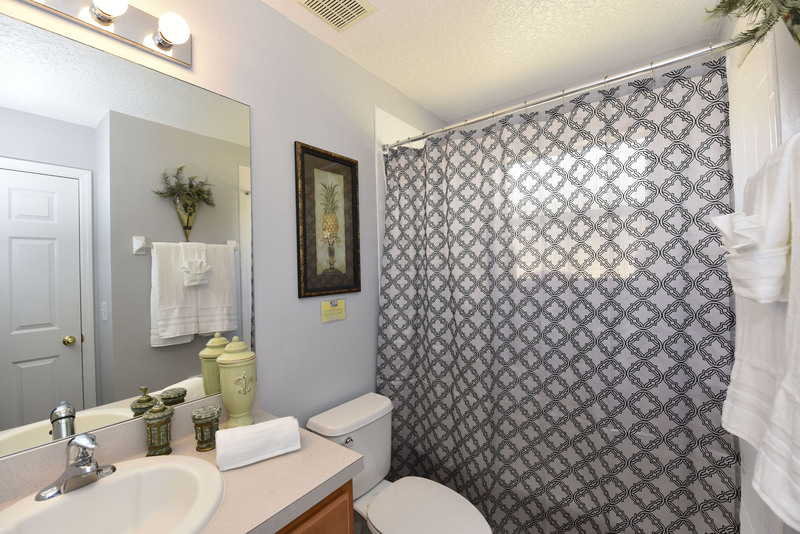 We were thrilled with the home, we absolutely loved it, it was perfect for our large family!!! Thank you so much for doing such a great job with the website ease of use, the excellent way you kept in contact & the prompt answers to our questions. 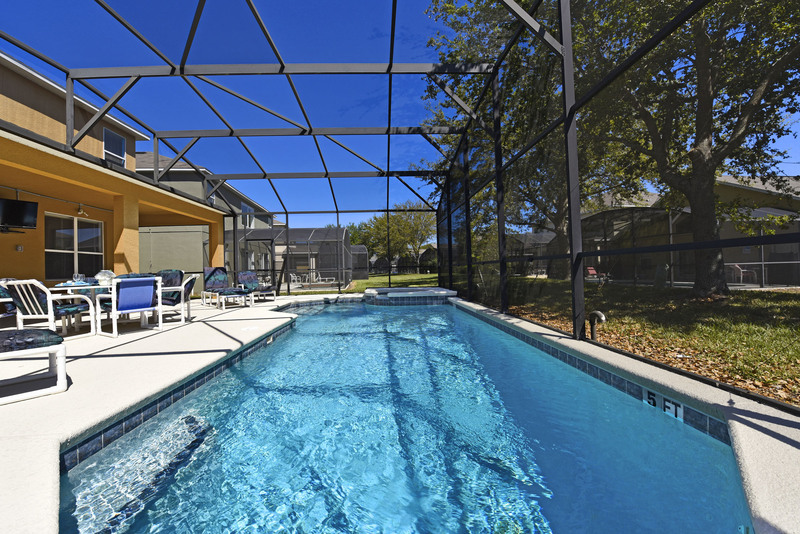 We will recommend your website to all of our friends who are planning an Orlando trip. The house at 8524 Sunrise Key is a beautiful property & was such a joy for our children & grandchildren, it made our vacation great & our 3 yr old granddaughter can't figure out why we don't still "live" in our Florida home!! Thank you Orlando4villas!!!! I brought a group of 20, and we rented 2 homes side-by-side. Emerald Island is a beautiful resort, and our homes were wonderful. 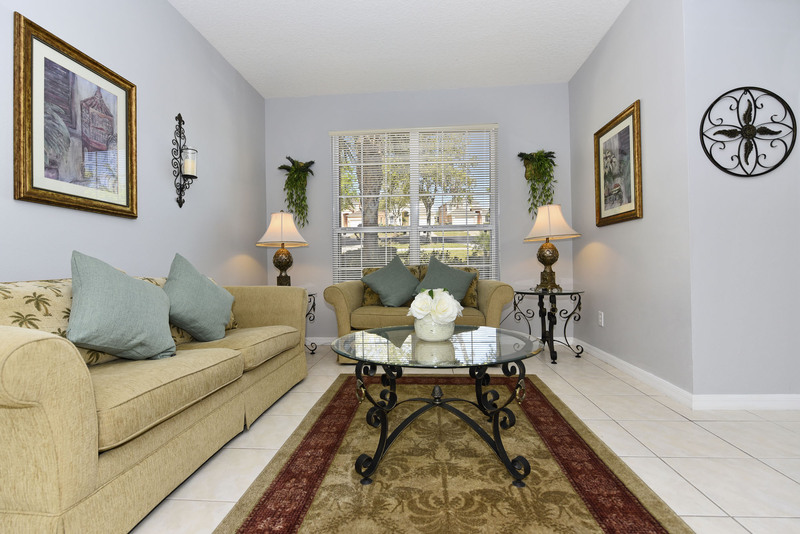 From amenities and furnishings to convienence and location, everything was perfect. I'll definitely stay at your homes again.